As email marketing professionals, we know the value of a great active list to send to. After all, if you’re not collecting new email addresses, then how are you growing your email database over time? At ICND, we’ve spent lots of time working on the tactical part of email marketing messages: what’s the best time to send, what segment do we send the message to and what do we include to generate the most clicks? But, at the end of the day, email lists with more members get more clicks. In short, bigger (lists) are always better (for your traffic and bookings). With that in mind, we set out to help a client reach their email marketing goals — encourage more bookings, drive action and get more traffic to their website. At first, we added our typical email strategy: tracking capture points, optimizing copy and CTAs and creating urgency to sign up for this client’s newsletter. It worked — we were gaining new email addresses but sadly also losing email addresses too. For every few emails we added to the list, one may unsubscribe during the next marketing message we sent. Let me be honest — the list growth for this client was fairly stagnant. Armed with this information, we set out to help grow their list with a plan designed to garner more attention, signups and results. If you’ve been on any e-commerce website or blog over the past few years, you’ve probably seen the trend of email popups dominating your screen. Large, in your face modals are all the rage. As we’ve learned, there is a good reason for that: They work. In Spring of 2015, we added a popup modal for our client located in a popular beach destination along the South Carolina coast. The popup modal didn’t just come up on first page load but instead had a careful set of rules set before it would show to the potential guest. Reviewing their 2015-2016 Google Analytics revenue reports lead us to pull the stats: the email modal was a smashing success. 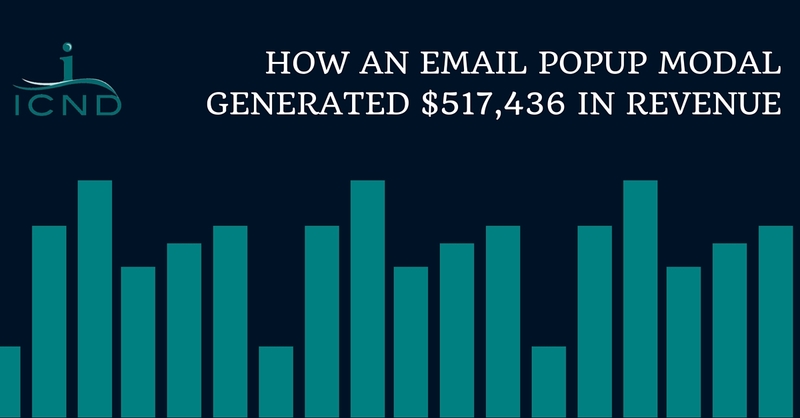 The email modal added 4,656 new emails, generated $517,436 in bookings and lead to the biggest email database the client has ever had: 26,000 and growing. Working with other email marketing clients, this question keeps coming up: why the dollar discount? Ideally we’d offer a percentage discount so that we’re not giving alternate discounts to each rental. Some rentals are $1,800 per week while others are $3,200 or more: why the flat number? It all came down to testing. When we first added the popup, we tested the impact of signups on offering a 5% discount versus a $25 discount. In all cases, 5% is a much larger discount in terms of dollars compared to 5%. Yet, the dollar amount won every test we ran. Having to do the math on a 5% discount versus the simple idea behind $25 proved to be too complicated: guests preferred the easy version. Common Question: Do I Have To Discount? Nope. We’ve added popup modals for many other clients without discounts: but they don’t convert nearly at the same percentage. Should You Add A Popup Modal? Put simply, yes. We’ve seen stellar results from adding these popup modals to our clients websites, but discounts lead to the best results. If you want to get started, contact us today and we’ll get you setup with more emails.